SAAD Scalper is fully automated EA and handles two strategies at same time with its unique style to make most of trades profitable. The EA scalps pips by its strong Entry strategy. 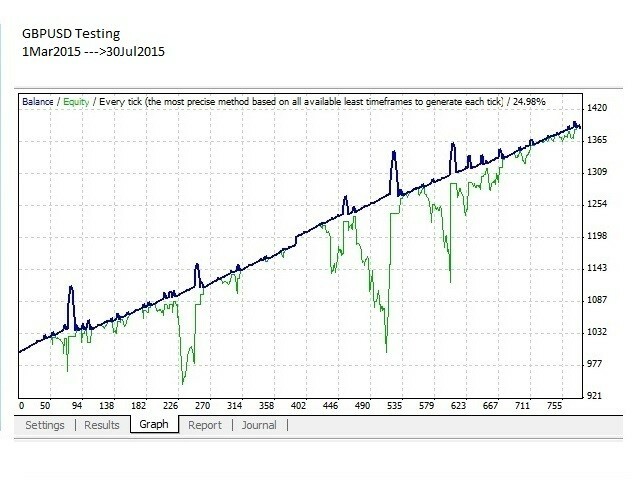 Trades that are not successful to scalp are handled in a different and unique way of martingale. It includes two options to deal with open trades. It works on multiple currency pairs simultaneously and best results found for EURUSD, GBPUSD, USDCHF, USDCAD, AUDCAD and AUDUSD. More trading opportunities for lower time frame. Lot Size of each Trade - Default value 0.01. Set as per your equity. LotModeAuto - Set False/True as per your requirement. %Risk - Lot is calculated as per formula Lot= AccountEquity* Risk/100/1000 If LotModeAuto is set True. Design Lot Size as per your requirement and Risk Factor. Target Pips - Best value found 100 for 5 Decimal Broker as a 10 pips. Set as per your testing results. Stop Loss - Default Value is 0. It works only if both martingale are set to False. As per testing results it is not recommended. This feature is included as per request of different users. Use it as per your experience. Magic Number - Magic number should be unique on same MT4 terminal. Please note that: You can use only one Martingale at one time. If both are true, martingale will not work. If you want to use StopLoss feature keep both false. 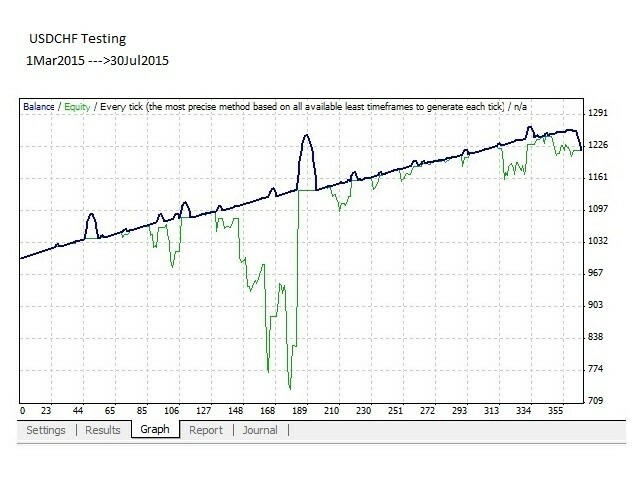 If any one of true, StopLoss feature will not work. 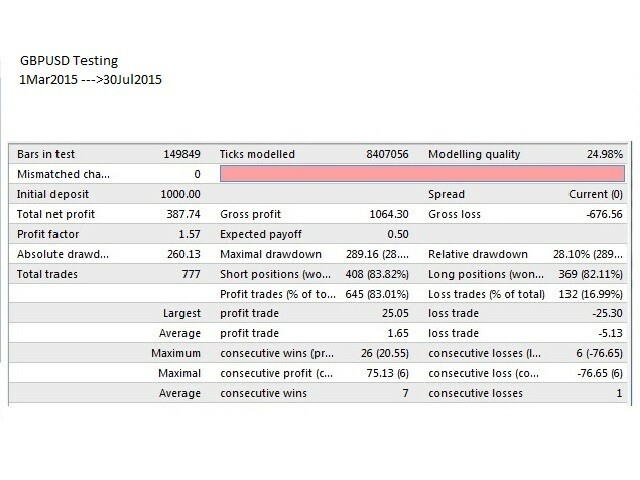 Steps in Pips: Default value 500 for 5 Decimal Broker as a 50 Pips. You can design it as per considering your Lot Size, Equity and Currency Pair Price Movement Span for safe use of martingale to avoid Margin Call. 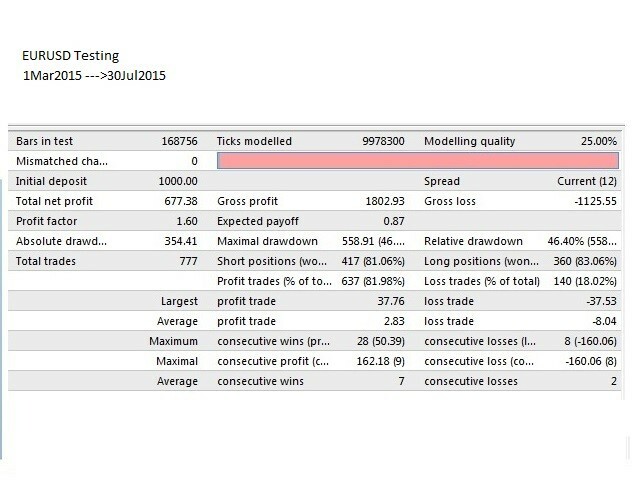 Steps in Pips - Default value 700 for 5 Decimal Broker as a 70 Pips. You can design it as per considering your Lot Size, Equity and Currency Pair Price Movement Span for safe use of martingale to avoid Margin Call. Open Pending Order - Default value 400. This value depends upon Steps in Pips. Example 1 Sell - If original order is Sell and price hits 700 steps above the original order level Pending Order Sell is initiated 400 steps above the previous Sell Level. Example 2 Buy - If original order is Buy and price hits 700 steps below the original order level Pending Order Buy is initiated 400 steps below the previous Sell Level. Pending Order Expiry in Days - Set Pending Order Expiry time in days. Default value 30 days. Volume Level - Set Level if Apply Volume Filter is True. Volume Filter is introduced to avoid any trade during high volatility and market noise. 80% DD it's not good. Excellent and brilliant coded EA. Receive clean and honest 5 stars*****. GOD bless you for your generosity. За первые два дня работы на долларовой демке работает стабильно. На пробу поставил на пару eur/gbp, в результате три лота в плюс. После пары месяцев работы советник начал путаться и ушел в минус. Либо автор должен озвучить расписание и условия стабильной работы советника, либо кому интересно методом тыка подгонять настройки. Почти два месяца висит в просадке, открыл море ордеров. Просадка растет большими темпами чем прибыль! Easy to set up. Works well on 1m, 5m & 15m time frames. The EA does work. There are periods of a lot drawdown, and im not sure how the EA will respond when market does not cycle to return lost profits (or has it responded properly to knot blow account???). But I have been testing since for 6 months, and it appears safe. 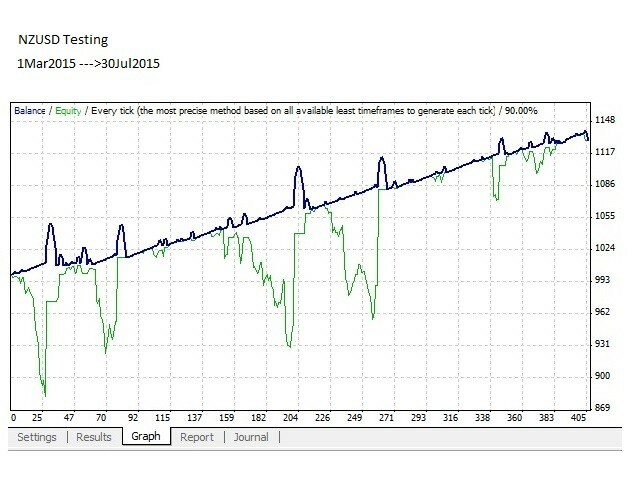 I will say that the amount of drawdown for the profit received.....it not worth the risk of a lot of money. I gained about 16% of that time, but drawdown around 60%. Советник классный... Но если его доработать, то может торговать ещё круче. Спасибо автору за идею!!! Fantastic EA. Using ActivTrades (1:400) account: Stable profits even on small accounts for the past two months. Great results - constant profits. I have been using it 6 months now with 50% profit. This is a very good EA. Thank you Adnan for making this EA. There is a very big problem with that EA. I had tested the EA with EUR/USD and AUD/USD in several timeframes. The results in M30 was the best. I set up in both currency with the same setting like I tested. Surprisingly the EA works differently on a demo account for 7 weeks. The results are much worse. The biggest Problem is the missing SL or automatic closing when the main trend runs against the trade with high momentum. It's possible that the trade will go in minus for more than 400 pips without any action of the EA. And more: the EA tried to open 13 more trades in the wrong direction and against the high momentum. 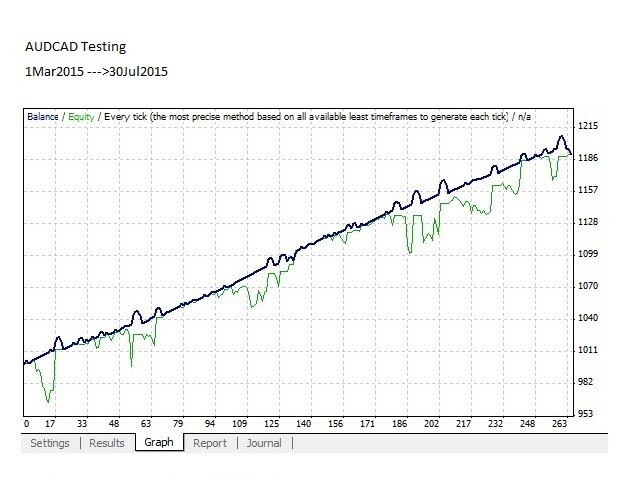 The second very strange problem is, after the pure performance at the demo account I let run again the strategy tester with the same broker and the same setting. The results were strong different. 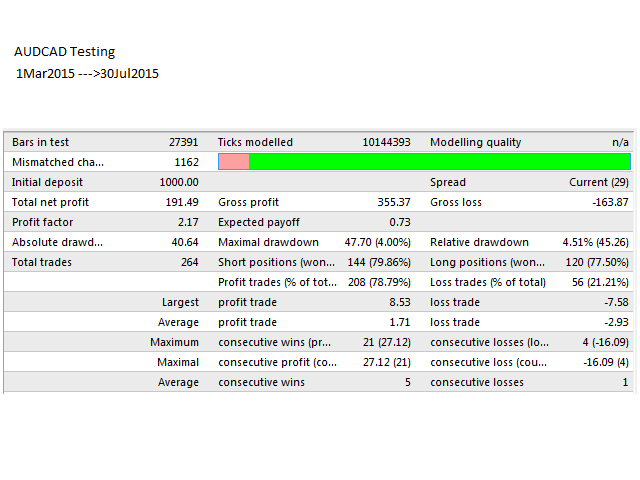 All heavy bad trades was not in the list of the strategy tester, they did not exist, not opened. It seems there is any wrong in the script. I canceled all no open trades and restarted the MT4. The EA started some of the pending orders again. After a restart of the computer, the EA didn't do anything more, like a hard refresh of any variables. This is the reason for only 1 point. ушел в просадку второй день . Some people can tell me how put the Ea to work? thanks. За четыре месяца на реальном счёте получил 300 % прибыли.Не каждый платный советник такое выдаст.Автору огромное спасибо! Works best during volatile periods, especially month ends. Set a conservative settings and see how the magic works. I could probably be more aggressive, but prefer to build my account now until it gets big enough to trade bigger lot sizes. I really encourage anyone to try this robot. But, make sure you have a broker that allows simultaneous buy and sell trades. Robot works best in volatile swings. 5 stars for this FREE ea! Set up properly, I have daily profits. Dangerous Martingale-Grid not stable at medium long term!! It`s the best EA what i see for free. One is very nice his value to start can be €100 and going up. VERY GOOD. I`M VERY HAPPY THX BRO. Works fine! Safe, small but stable profits. Good job! Nice Work and Free. I am using it with my trending EAs to hedge losses during choppy market. 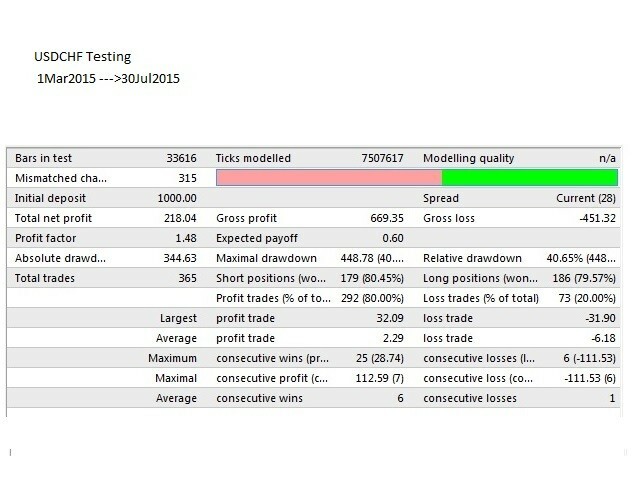 It completed my system and reduced losses that I was facing during trend strategies. Didn't work well for me. Using it since long, Good results so far. Entry positions are good. Just watching what it is doing. 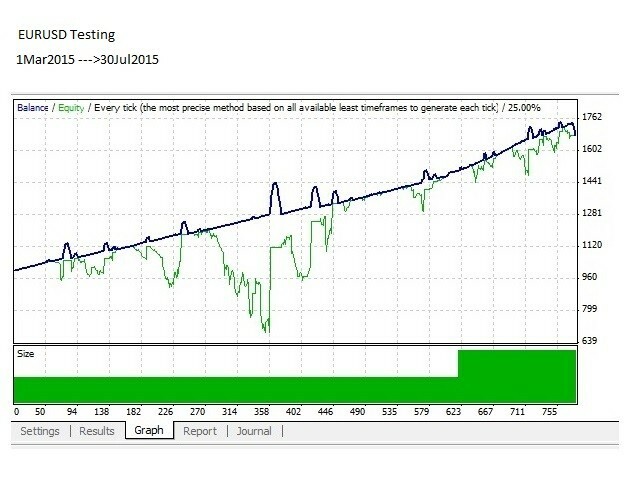 Be careful it is martingale based but I found safest martingale of all EAs I have used. Before using it live, it needs to be understand. dont know how people have good results. It burns a 100k account with 1 % risk in may 2016. Great EA. If you are patient, and let it do its work, it is simply great. I love the way it keeps "bad" transactions open in order to match them up with "good" ones, and get rid of all of them with a profit. Really nice job. Thumbs up! Saadscalper I have tested and been using it for 2 days. Until then, everything worked very well, so I had only Provit. Today seems to me that whole bit before very funny. According to Journal n'von MT4 VPS and of Amsterdam Journal no problems are to be recognized, I have thereby taken only the signals that you have mentioned in their description. Nevertheless, it can see today so that not all signals werdeb used, although this would have to start because of good reports. Since this morning, he used only 2 signals, but these will not be closed even at high profit rate. In the Preferences EA I have not changed anything, Am I not, as long as I do not know much about it, or have no experience with. I suspect that is a mistake in the EA. If this is not so, then I ask for help. Otherwise, I ask you to correct the error. Since I am rarely since, wäher it be nice if you to e-mail me: would write hjoachim44@gmx.de. Thank you. Simply awesome. I think it's the best strategy. The result is amazing and yet it is free. I am using it on live account after testing. Thank you for this. Советник торгует на демо счете пока все сделки в плюсе.Спасибо разработчику. This new updated ea doesnt have SL? If set properly, it's really good EA. So far so good. 5 for you Adnan. This is a nice little EA. Awaiting for next release for PO. Current version working fine. Working nice so far. Very good EA. I am new so I'm not very good at manual trading. My solution was to go looking for EAs that would help me out. So far this is the only one that I have been able to make a good bit of profit from. Only a few times it opened a trade and the market went against it. I had to close it before it got too ugly. But it was only once or twice, since that I have been watching the trades. Another thing I have been doing is trusting it more. When it opens a trade and the open trade starts taking loss I end up opening another trade with x2 the lot size. So far it's been working. Even if the EA was going to be a little off (doesn't get to the 100 pips) the trade I opened usually covers the loss and still makes a good bit of profit. Thanks Adnan for the EA! Keep it up! Works good, but you must be careful. It has no SL. So you can loose everything if market goes in wrong direction. Watch the important news and close open trades manually if you see the risk. 2) New Feature Trailing Stop Loss is introduced. Trailing Stop is all internal coded and calculations. 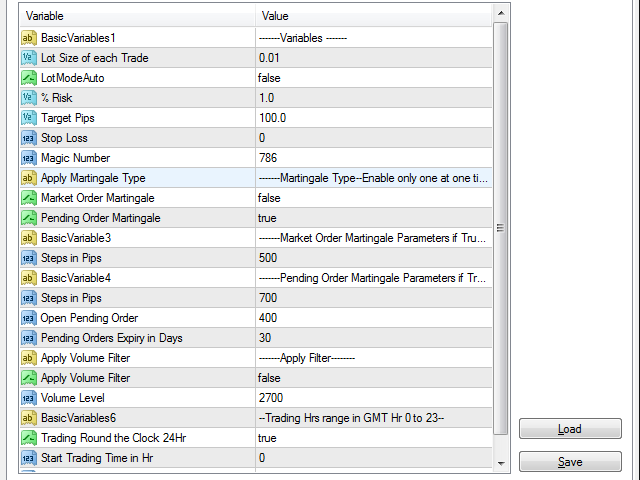 6) Input variable is included if user want to restrict maximum number of trades. 2) System restart will update PO levels to its maximum effort. 1) %DrawDawn of Balance: Users can take risk of its capital percentage. If drawdawn touches this threshold, it will close all trades. Version 1.9 includes new features to reduce Draw Down, avoiding to open unnecessary trades during high volume.It includes Stop Loss for original Trade only, as per user experience. Here is detail of three new features. 1) Stop Loss: For Original Trade only. It works only when martingales are disabled. 3) Volume Filter: It helps to avoid unnecessary trades during high volume. Please note that in this version Trade Entry Criteria remains same. Entry strategy is same as per previous versions.